Mom, the Intern: How to use all that Halloween candy (besides just eating it). How to use all that Halloween candy (besides just eating it). So, you have a kid or five and they went trick - or - treating last night, and now you've got so much candy in your house you're worried CPS is gonna come knocking. It's OK, they won't. But if you're a little concerned about the possibilities of rotten teeth, diabetes and/or post-Halloween hangover, never fear: I have some genius solutions for you! P.S. -- I can't take credit for these ideas. I merely scoped the Web and compiled them for you. You're welcome. 1. Save the candy and stuff it into a piñata for a future birthday or holiday party. Every year, Dill's family celebrates Cinco de Mayo (despite a glaring lack of Hispanic ethnicity. Oh well; it's fun). This is little Buckwheat having a go at the piñata earlier this year. I predict a lot of Dum-Dums in next year's piñata. 2. Use it to decorate gingerbread houses around Christmas time. When we were first married, we thought we were so cute (OK, we were) and we made a gingerbread house. Ironically, we haven't made a single one since then, despite having not one but TWO offspring. Maybe we'll make one with the kids this year with all our leftover Halloween candy. 3. Take it to your local dentist or orthodontist. Some of them, like this one, will buy your candy off you and then donate it to the troops overseas. Pretty sweet idea, especially if you're kids aren't crazy about sweets. 4. Stuff your stockings with it for Christmas. It might give your kid a complex to eat pumpkin-emblazoned treats on Christmas, so try to avoid those, or just pray it won't turn him into a convict down the road (it probably won't). 5. Add your candy to other desserts. I've never known a brownie to taste worse after the addition of, oh, chopped up Snickers. 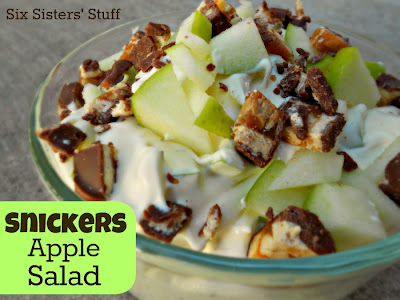 Speaking of which, apparently Snickers Salad is a popular Mormon confection (which I have never personally made and was unaware of until 2008) involving Granny Smith apples, Cool Whip and ... chopped Snickers. Sounds like it could be a fun addition to the usual Thanksgiving dessert faire! 6. Donate your candy to a school, church or other charitable organization. 7. Use it to make a creative candy card. Like this. Because, you know, you're worth more than "100 Grand." It never gets old. 8. Send it to your favorite blogger. AKA, me. ;) Nah, I'm just kidding. If you're totally out of ideas, just put it in a candy dish and let your guests have at it for the next ... oh, six months? It was waaaayyyy too cold here for my littles to go out for too long so we don't have too much candy :) But that snickers/apple salad looks amazing so I may have to go check out the day-after-Halloween candy sales to pick up some snickers! we didn't buy any candy this year, cause we weren't going to be home. good thing because my girls got so much candy our candy bowl is about to overflow! it's crazy how much they got. i'll totally have to stache some away for a rainy day or for my girls birthdays for treat bags! yes! score! Or do what we do and let your kids pick a handful, buy th rest from your kids, then throw that crap away! 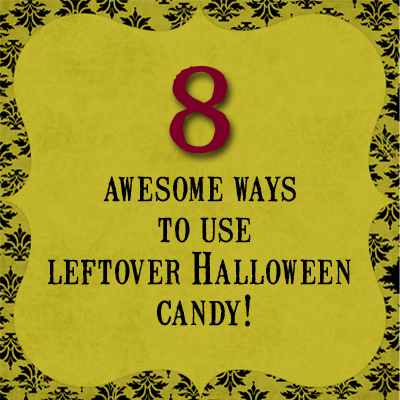 I traded new toys for my kids' candy, and into the trash it went!